Although asphalt driveways are durable, like any other surface that is constantly exposed to the elements, they can erode over time. Luckily, by keeping some basic tips in mind, this is less likely to happen. To extend the lifespan of your driveway, asphalt paving experts recommend heeding the following driveway repair and maintenance advice. Cracks and potholes form in asphalt due to the freeze-thaw cycle that often occurs during the colder months of the year. Water seeps into a small crack. If temperatures drop below freezing, the water turns to ice and expands. This pushes the asphalt outward. When the temperature rises again, the water melts, and the asphalt caves back in. This doesn’t just result in potholes. It also makes the driveway more vulnerable to erosion. Any water that flows over it will continue to tear away at the pothole, making it bigger. You’ll need to contact an asphalt paving company to repair it before the damage becomes more substantial. That’s why it’s important to keep water off your driveway as much as possible. Make sure your downspouts are directing water to other parts of your property. If the gradient of your lawn sends water streaming towards your asphalt, you may need to install buffers or drainage pipes to direct it elsewhere. Most importantly, fill in any cracks you notice, even small ones. Again, if water leaks into them, the freeze-thaw cycle could turn a small crack into a much bigger problem. You may be comfortable fixing minor cracks on your own, but if you’re not, get in touch with a driveway repair company to ask for assistance. Make sure that anyone who uses your driveway knows they must pull into and out of it slowly. Although water may be the primary cause of most asphalt driveway erosion, people pulling into and out of driveways too quickly has also been known to cause substantial damage. Obviously, you should practice safe, careful driving anyway. Just make sure that everyone else who uses the driveway knows this rule. To further protect your driveway from water erosion, consider adding a decorative border around the edges. If any water flows from the lawn towards the driveway, the border will direct it elsewhere. There are several options to consider when planning this project. If you have access to natural stones, you could arrange a small wall along the edges of the driveway. Be sure to place the stones close together to reduce the size of gaps between them. 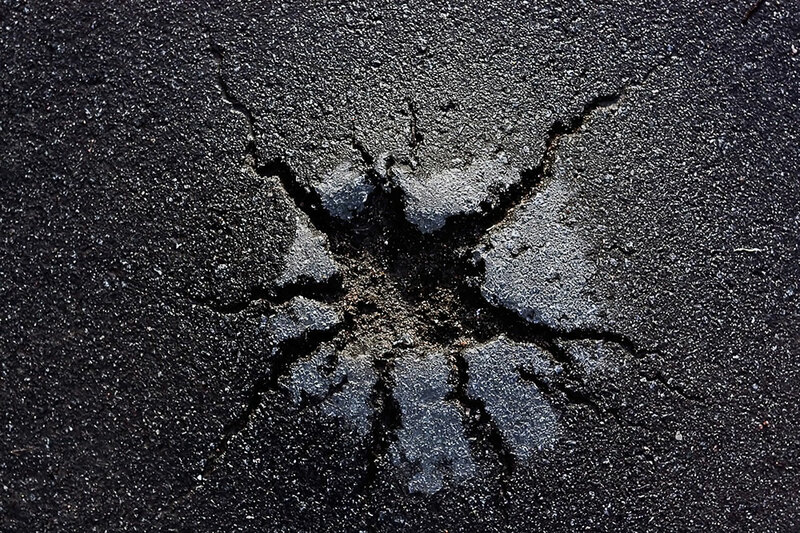 Be careful when installing them near the driveway; dropping a heavy rock on your asphalt could cause damage. You might also consider concrete pavers if you have the space for them. That said, you need to make sure you select pavers that are high enough above the driveway to have an effect. Some smaller ones might be too short to block the water from spilling over onto your asphalt. When gutters are clogged, water can’t flow towards the downspout. During heavy rains, it may start to overflow. This could result in several different types of property damage. The water may start leaking into the upper sections of your home, causing water damage and, potentially, mold growth. It can also spill over onto your driveway, causing erosion. That’s why it’s important to clean your gutters regularly, especially during times of year when you tend to get heavy rain or snow. If erosion does result in damage to your driveway, get in touch with professional asphalt pavers to repair it. Again, you might be able to fix small cracks yourself, but for more substantial problems, you need help from driveway repair experts. They’ll fix the damage, and they’ll be happy to offer tips you can follow to prevent this kind of issue in the future.